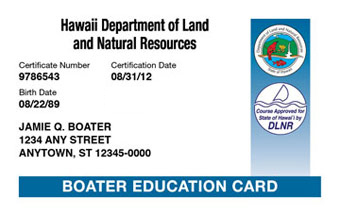 If your Hawaii Boater Education Card is lost or damaged, please contact BOATERexam.com® directly at 1-866-764-2628 to order a replacement. Faulty cards will be replaced at no charge (you must return your old card). Lost or damaged cards will be replaced for a $9.95 fee.